This famous figure of 16% has been repeated on all social media blogs so that it is now perceived as an uncontested truth by virtually all Facebook page administrators. Of course, the reality is very different: Your posts don’t reach exactly 16% of your fans, but most likely a little more or a little less — sometimes a lot more or a lot less. This 16% figure is the average of data from millions and millions of pages of very different types, it is a myth. The overall average fan reach is certainly close to 16%, but in reality, the best pages have a 47% reach, while the worst only reach 2% of their fans! Are you closer to 2% or 47%? This is the real question. 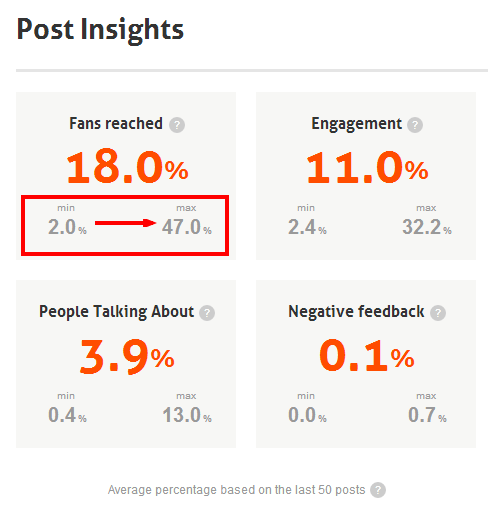 Fan reach simply corresponds to the number of fans of your page who have seen any given post. This reach is called “organic”, which means that it only records the views which result through no action of a friend (such as like, share, or comment). The views that are a result of actions are recorded in “viral” views. Unfortunately, the Fan Only reach metric is not available in the Facebook statistics interface, just the “organic” reach. Fan reach is only available in the Excel file which is available for download in your dashboard. You’ll find it under the label “Lifetime Post reach by people who like your Page”. Unfortunately, this is not as user friendly as the web interface. To easily measure it, you’ll probably resort to paid Facebook statistics analysis software such as Pagelever, Simply Measured, or Agorapulse. 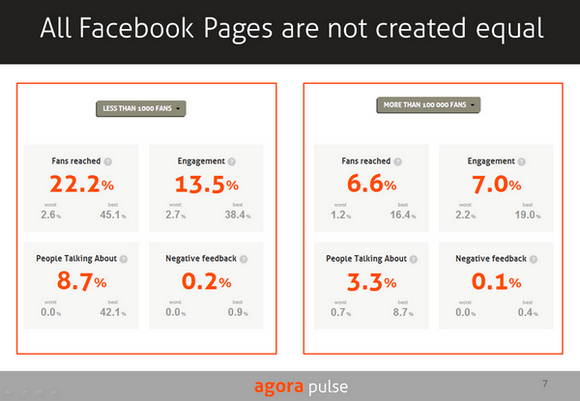 If you try Agorapulse, the best thing to do first is to try on of our free services like the Facebook Page Performance Barometer. Organic reach corresponds to the number of people, fans and non-fans, who have seen a given post. Organic reach only records views which are not the result of a friend’s action (such as like, share, or comment). The views that are a result of an action are actually recorded in “viral” views. 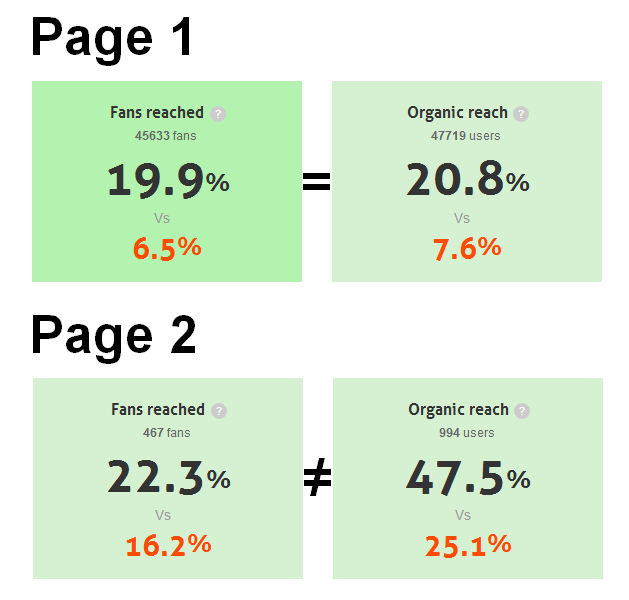 The real difference between the reach of fans (below) and organic reach is that the latter include views of people that are not fans of the page but have directly accessed your page or seen its content in a widget (for example, a “like box” on your site or blog). Although you’re not able to see fan reach in the Facebook interface, scope can serve as a substitute data point. On the other hand, it won’t be exact and in some cases could even be quite different from the fan reach. From one page to another, the difference between scope and organic reach can go from small to one more significant (more than double here). 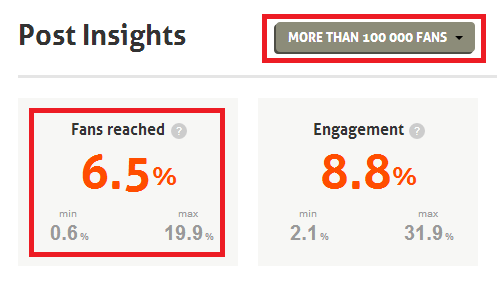 If you use organic reach as a reference measurement, make sure your page is closer to the former than the latter. Above is an example of a page with 500,000 extremely active fans. As you can see, its performance in terms of fan reach, engagement and “people talking about this” is more than double that of pages of the same size. In theory, all the ingredients are there to create “buzz” and benefit from a viral reach more than the rest, but it is not happening. This page only benefits from a viral reach equivalent to 1.2% of its fans, dismal compared to its organic reach of 15.4%. Facebook has revealed on February 22nd that a bug on their insights has led to a misrepresentation of Organic and Viral reach for most pages. According to data, the way pages have been affected by this bug varies significantly from one page to another. 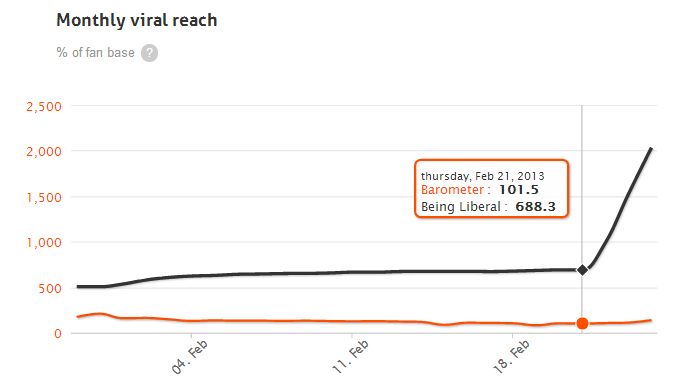 Apparently, Organic reach has been slightly affected (between 5 and 10% more reach starting February 23) but viral reach has been much more affected with more than 300% increase in some instances. As a result of this bug, I advise you to check the evolution of your Organic and Viral Reach on the Facebook Page Barometer to find out how it has affected you. No need for a lengthy definition here; this is simply reach obtained through paid means, such as promoted posts and advertisements (Sponsored Stories). Paid reach can come from fans or non-fans. Total reach is the sum of organic, viral, and paid reach. The complexity doesn’t end there. Beyond the type of reach (organic, viral, etc. ), Facebook also allows for different time periods to be measured. Fan reach — organic, viral, and paid — can therefore be measured over multiple periods. This is the fundamental unit of measurement. It’s also the one used in the context of our discussion of the “16%”. It measures the number of people who have seen a particular post. It is the most important measurement because it lets you compare posts to each other without regard to how frequently you post them. It is not actually a “period” of time, but rather the basic unit for measuring reach. This is the number of people (fans and/or non-fans regardless of whether they are organic, viral, or paid) that the page reaches each day. This metric is relevant if you publish every day and publish the same number of posts every day. I personally don’t find this metric so interesting because it represents very little and is too heavily influenced by post frequency. Same definition as the weekly reach, but here, like its name indicates, the measurement is made over a month (28 days to be precise). Behind post reach, this is my second favorite metric because it shows me the total number of people who have seen the page content at least once in the previous month. Remember: Post reach is the only good indicator of the quality of your content and good health of your page because it is not influenced by the frequency of your posts. On the other hand, weekly reach, or even more so, monthly, is a good indicator of the visibility of your brand during over a given period of time. By definition, Facebook users are not permanently connected and cannot see all your posts. That’s why it is interesting to see the percentage of fans reached over a given time period, especially to have an approximate idea of the percentage of fans with whom you have completely lost touch. The percentage of fans that haven’t seen your posts over a month is probably a good estimate of the percentage of fans who no longer see your posts at all. 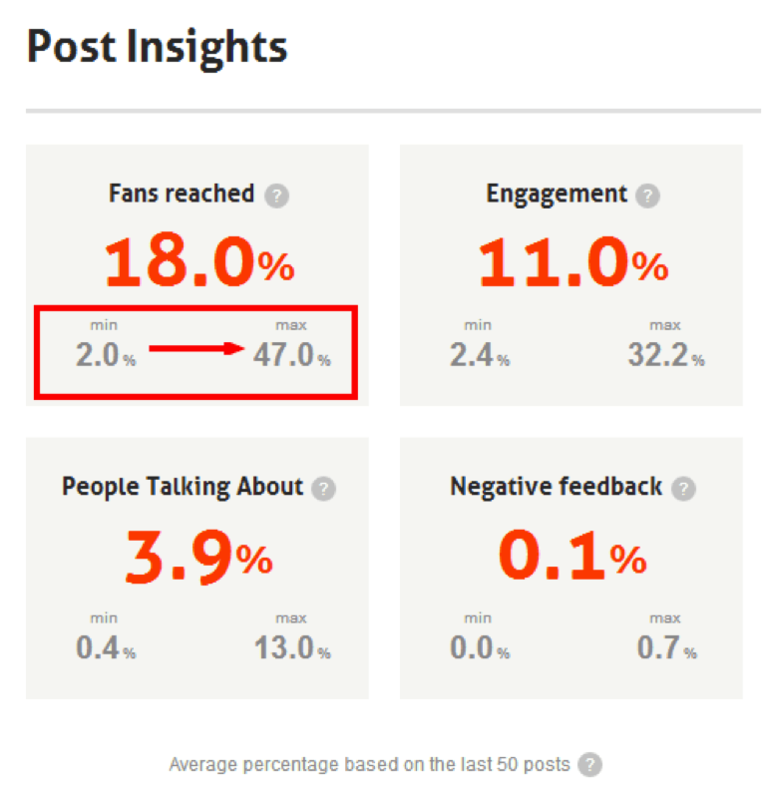 Post reach is probably the most important metric. It is a key indicator of the appeal of your content to your audience and the quality of said audience. An audience recruited from an eye-catching contest (or worse, bought by the thousand from sites with practices as questionable as their effectiveness) will quickly unfollow from your posts. If they don’t actively unsubscribe, their lack of interest, and therefore disengagement, will cause them to be effectively unsubscribed from your publications due to the relentless effect of Edgerank. Unfortunately, this feature has disappeared. Personally, I don’t really understand why it had such a short lifespan, just a few weeks. More attention must also be given to post reach than other measurements (daily, weekly, monthly reach) because, for example, a high frequency of posts to an interested audience will give you a daily reach which could seem correct but is artificially “bloated” by the sheer number of posts. To continue, let’s take a look at the factors that can influence this visibility percentage. 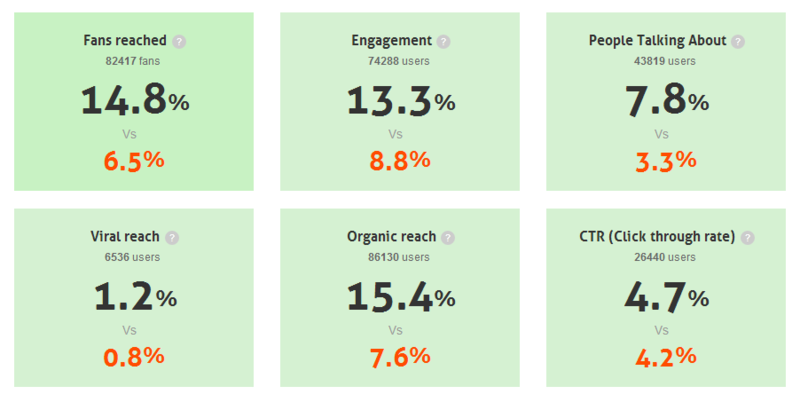 What factors can influence your average reach? In the land of Facebook, small is beautiful! It is a fact that the “smaller” your page is, the higher percentage of fans you will reach. According to statistics that we have based on more than 3,000 Facebook pages, those with less than 1,000 fans reach on average 22% of their fans per post while pages with more than 100,000 fans reach an average of only 6.6% of their fans with each post. The mere fact that your page has less than 1,000 fans or more than 100,000 will have a significant impact on your potential reach, regardless of the quality of your content. Performance averages calculated above for almost 4,000 Facebook pages clearly shows that the size of pages strongly influences their performance averages. To see this data live, go to http://barometer.agorapulse.com. Small or large, not all Facebook pages are equal. The differences in Facebook pages’ reach isn’t just about their size. Even within the same size range, the variance between the best and the worst is absolutely astonishing. For example, pages in the range of 100,000 fans have an average fan reach of 6.7%. However, the average of the worst 5% performing pages shows a reach of 0.6% of fans (oops! ), while the top 5% performing pages reach an average of 20% of their fans with each post. Wow! The best pages, therefore, reach 3 times more fans than the average on a percentage basis! We went a step further and examined the figures for the top 5% performing pages. Among them, the top performing page reaches up to 29% of its fans with each of its posts. Impressive! This means each post of this page reaches more than 30,000 people on average… and that is without any paid advertising. The first thing you should do to debunk this myth for yourself is consult our Facebook Page Performance Barometer to find the average reach that corresponds to your page size. This will give you a benchmark for comparison based on a sample of similarly sized pages. Then, if you would like, you can install the application to calculate your average reach for the fans of your page, which will save you the trouble of having to calculate it manually. Is your average fan reach closer to 2% or 45%? Please share your score in the comments — I look forward to helping you analyze and improve them!